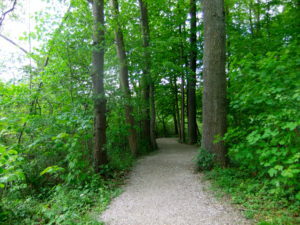 Back to the roots: Connect with Nature! What I love most about painting is to crate art in an organic sensibility. To be mindful of the materials I use and how they effect the world around me. 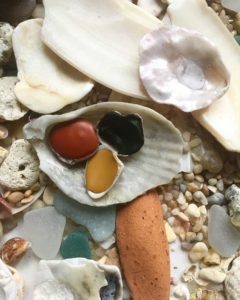 Every day I continue to be inspired by the intensity and strength of natural pigments and the beauty and wisdom of mother nature. As a scientist I clearly see the impact art supplies have on our environment and I know it’s time to make a change. 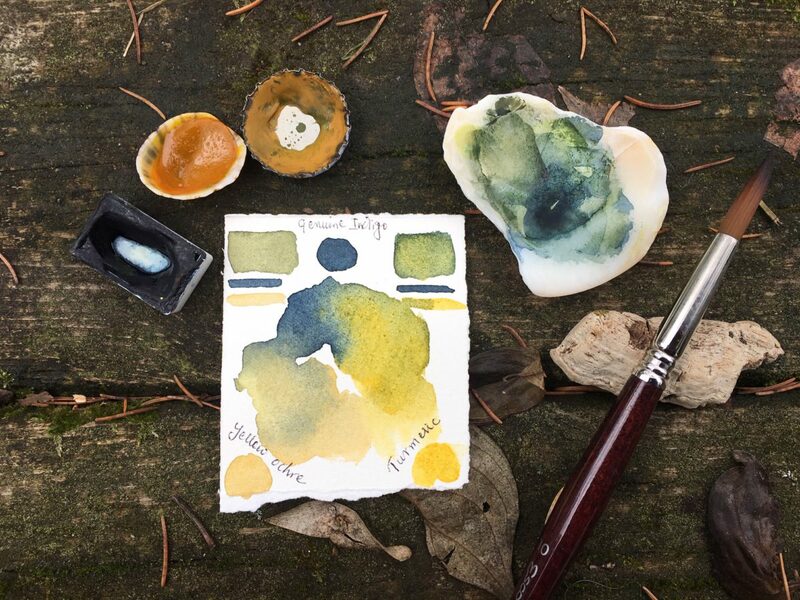 Working with natural pigments has led me to a much deeper connection with the natural world. Our planet really is a glorious treasure house and offers an endless supply of infinite colours. My name is Jyotsna and I am here to inspire and ignite the passion for natural colours. It’s time we start using them. For the safety of our health, our famililies health and that of our planet. 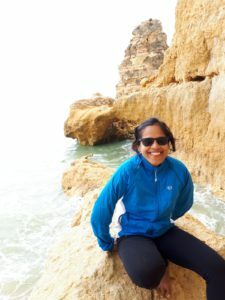 Author jyotsnaPosted on 8th March 2019 8th March 2019 Leave a comment on Back to the roots: Connect with Nature! My education over the years led me on a path of science, research, discovery and development– in other words nothing to do with art for several years. Life has a way of waiting patiently until you are ready for your purpose. I believe that my purpose was to become a watercolor artist. 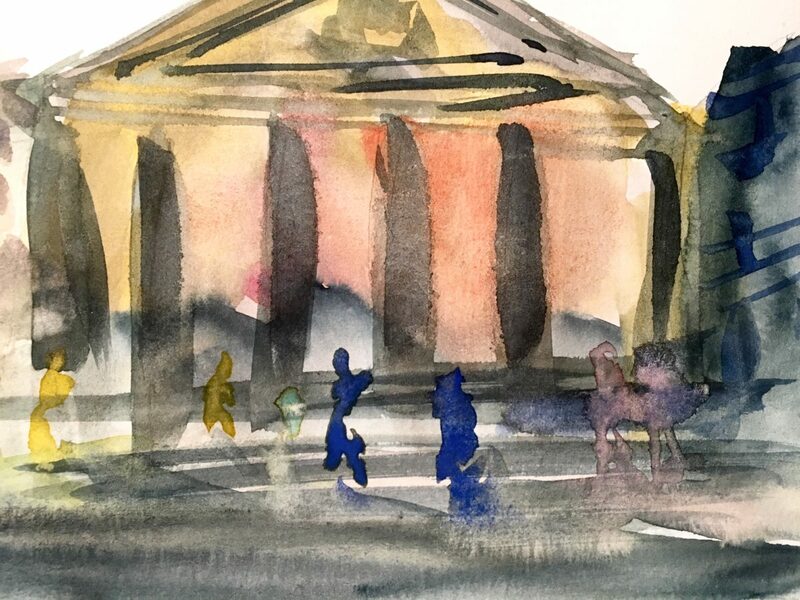 It was only two years ago that the long lost connection with the artist that was within me got reconnected and I transformed from being a scientist for almost two decades into a full-time artist. And I am loving being one! 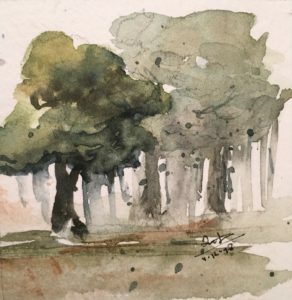 My love for watercolors and the guilt! 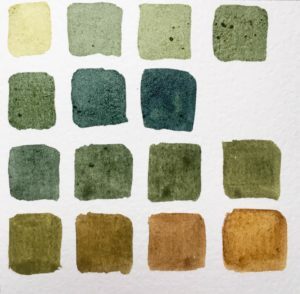 The alchemy of water, pigment and paper merging together is quite satisfying and unique to watercolors. I carried on using this medium despite the guilt of polluting the Earth with toxic chemicals, remaining ignorant of any other option. 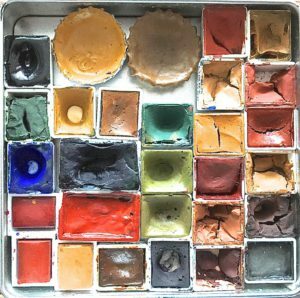 A great many watercolor paints and pigments that are out in the market either are NOT healthy for you or others are completely neutral. Thanks to my years of training as a scientist that I cannot overlook not knowing the chemical composition of any pigment that I work with. When I learned that it was possible to make my own paints from Earth, my passion was ignited and the whole process then became strongly aligned with my intrinsic values. Step into the little corner of our guest room/studio where stands the classic Austrian REX marmalade jars containing a very small collection of my consciously selected beautiful Earth pigments; yellow and Red ochres from Italy, Cool Green Earth clay from Cypress, Orange ochre from France and a beautiful organic Indigo blue pigment from India. There is a natural attraction between the entire spectrum of earth colours, and this impression of pigments resonating with each other is evident in all of my work, which is painted using mostly the earth pigments, and I call them my ‘Dirty Paintings’. I remain in awe of the intensity and strength of earth pigments – there lies a whole palette of colours beneath your feet. While painting, I prefer to apply the pigments in layers until the earth I have painted glows with the same intensity as it did in its native state. Why do I paint with Earth pigments?! 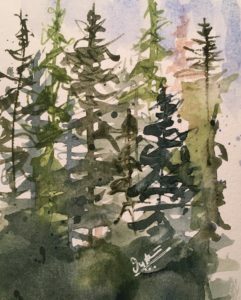 For a variety of reasons, I have made a point of only using natural Earth in my daily art practice . In fact, the only watercolors that I ever paint with are my own handmade watercolors (unless stated otherwise). The most obvious benefit of making and working with paints from natural resources is that we’re no longer poisoning the Earth or ourselves with unnecessary chemicals and toxins. are actually superior to synthetic paints: they are more permanent (think cave paintings), and are not affected by sunlight, humidity, temperature or impurities. There is no need for added fillers or stabilisers to increase shelf life, and the colors themselves are more intense because the light bounces off the irregular surfaces of each particle. I don’t know of many artists who love painting with Earth pigments at least not on the social media platform. I had conducted a poll some time ago to know from artists if they knew what was inside their paint. I was not surprised that 85% of them voted NO. Although, statistically this is not significant when the sample size was only approx. 120. But it did give me an idea that many people really didn’t know what’s inside their paint? The toxicity problem in an artists world is kind of a blurry area. There’s no simple answer sorry. 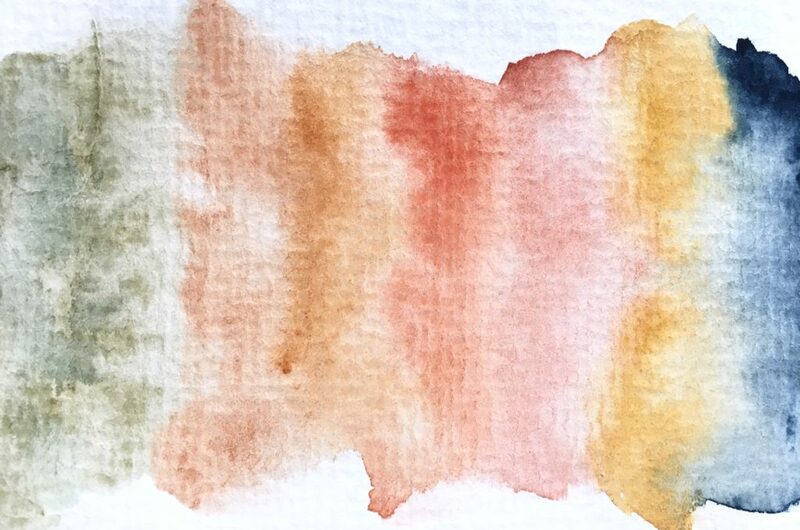 Watercolor paints usually have a low toxic index, including the ones stating “natural ingredients” such as Earths like Burnt Sienna, Raw Sienna, Burnt umber, Raw Umber, are quite toxic in nature ! The toxic effect of heavy metals in paints is very well known to us and is stated clearly on the paint tubes or the MSDS provided by the manufacturer, but I have not come across any paint that mentions anything about the presence of toxic trace minerals. For. eg paints like Malachite, Azurite, Emerald green, Viridian etc. 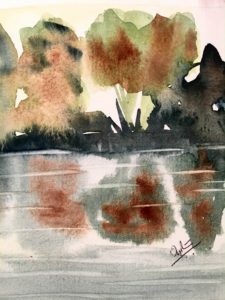 This also applies to the wide range of handmade watercolors that have flooded the market in recent times where complete information about the paints by some suppliers is not provided except for the marketing name under which they are sold. I know of many artists who ignore the safety aspect of the art material they work with. 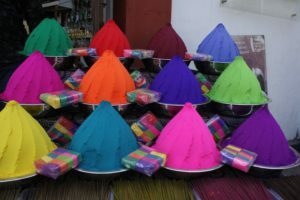 In fact, many artists may feel that they are exposed to toxic painting pigments in such small quantities that no danger to their health is likely. 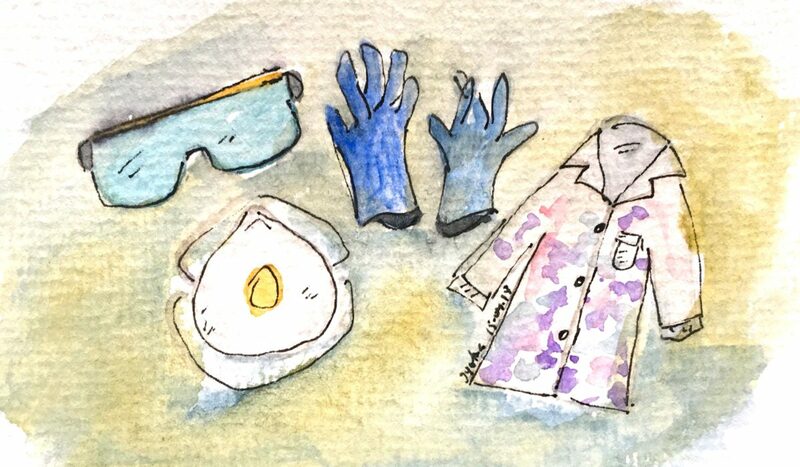 However, it is important to understand that repeated small doses of hazardous materials might prove to have a cumulative effect on an artist’s health that may become evident at a later date. Especially, if you happen to be a passionate watercolor paint maker too. 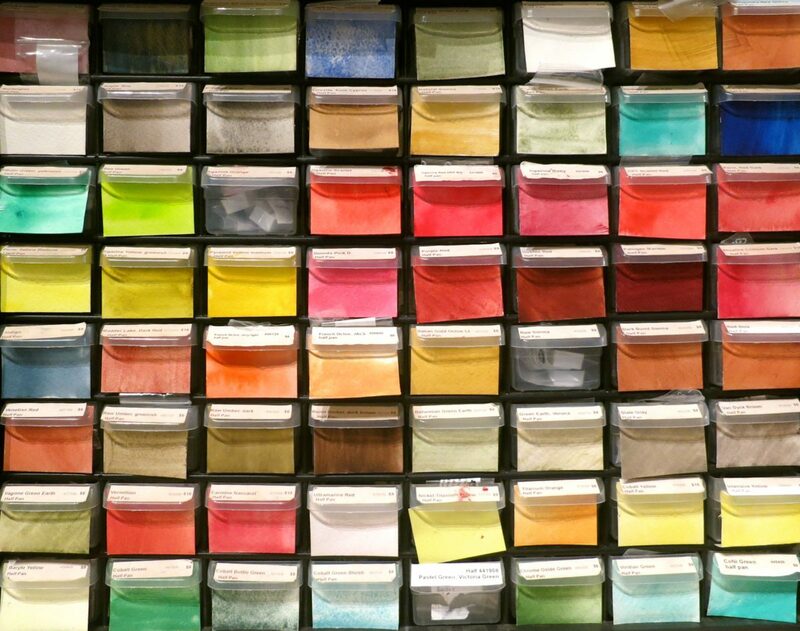 Pigments in pulverized state pose higher risk as opposed to when bound with a binder. The body may be able to rid itself of the poison but it may take a long time to do so. If toxic material is absorbed at a faster rate than it can be excreted, the accumulation may cause serious illness. 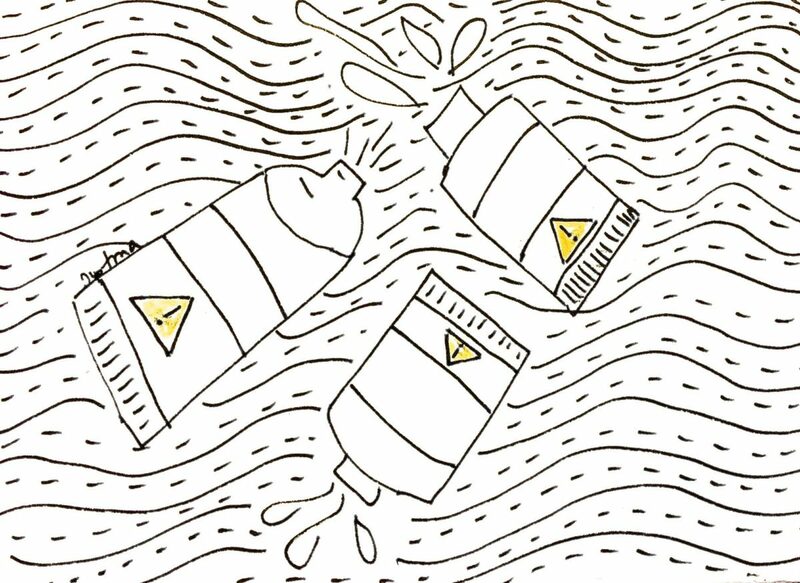 Reactions to a toxic material may vary according to the artist’s age, size, or physical condition. By saying so, it certainly doesn’t imply that you should stop painting or making colors or be scared to reach out to your box of watercolor paints /pigments. Painting is a beautiful activity that allows an individual to capture their feelings. In fact , most daily activities, from washing your hands, to walking in the streets, involve dealing with low doses of toxic pollutants that lurk in our environment, and sometimes ingesting them! I just don’t like to ignore and expose myself to accumulate low risks. Therefore, its important to inform yourself about what you are working with. Once you have learned about the risks, and took the proper habits while creating your piece of art… paint to your heart’s content! 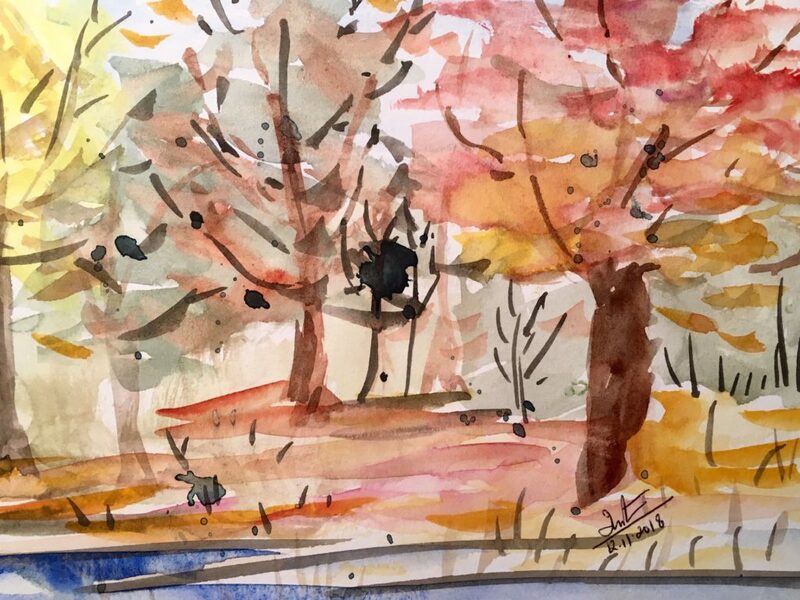 Author jyotsnaPosted on 23rd November 2018 23rd November 2018 Tags earth pigments, eco paint, handmade watercolors, watercolor supplies, watercolorsLeave a comment on “Let’s get Dirty”! 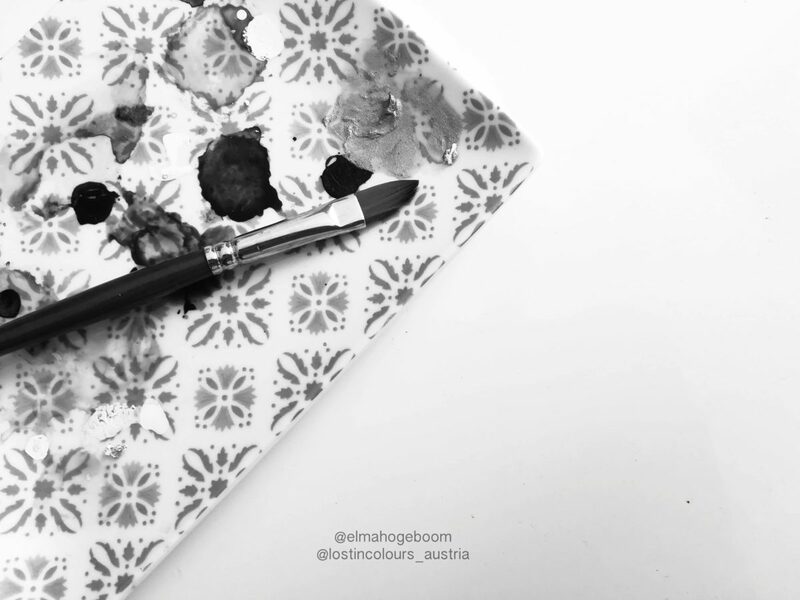 My name is Elma Hogeboom, a sustainable artist from the Netherlands. 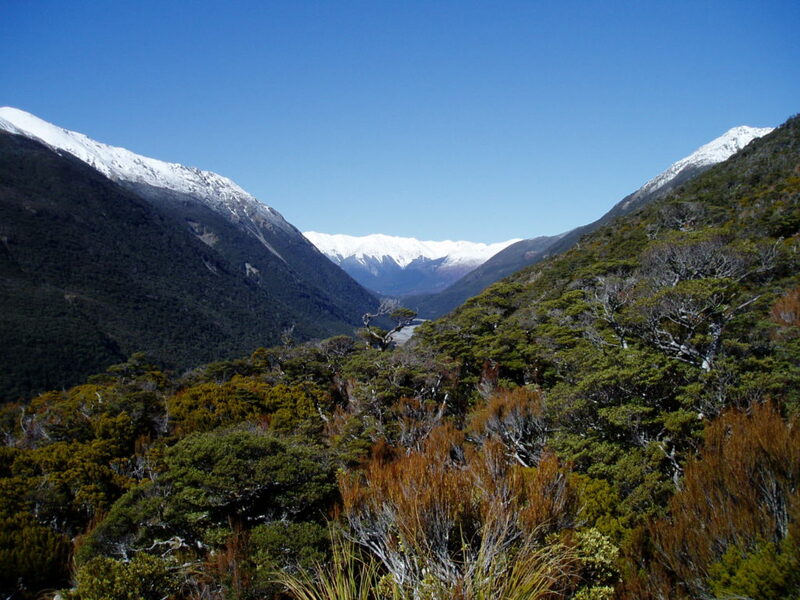 I strive towards a sustainable lifestyle in every walk of my life. Art is a huge passion of mine and I apply sustainability to my passion too. After a long painstaking research, I found out that sustainable materials to create pieces of art were either very scarce or non-existent! It got me thinking: in this day and age, how in the world can we not transition to sustainable alternatives in art? Connecting art and sustainability requires creativity and unconventional approaches, a challenge that I love! So I started my journey in sustainable art. A few weeks ago I discovered something called eco glitter, it sparkles in all colors and is completely biodegradable and eco-friendly. All those pictures of sparkling hands and eyelids… – yes, it seems perfect for make-up too! – Now I’m not really the ‘over-the-top makeup’ kind of gal, but if I were, I would definitely stock up big time! After this incident, I started thinking: what else did I see on Instagram that might not be such a good idea to try myself? I knew that I had painted with my bare hands in the past, inspired by intuitive artists and their beautifully captivating pictures of bare hands covered in paint. I stopped doing this because I thought it might have a negative impact on my health. However, as this seems to be some sort of trend nowadays, it seemed like a good idea to share why I quit painting with my bare hands myself. As a sustainable artist, I spend lots time researching the materials I use in my art practice. I read about pros en cons for the materials I use, with regard to their eco-friendliness, impact on life on this planet and the circumstances under which it has been produced; talking about light reading! But sustainability also includes thinking about my own health, especially when I’m in direct contact with chemicals like paints. Now, many (professional) paints contain heavy metals, like cadmium, cobalt, manganese, zinc and lead, that not only have beautiful colors, but which can be very toxic too! And these metals can cause severe health issues, like cancer and metal poisoning, when we fail to handle them with the proper precautions. For example: inhaling cadmium may cause lung cancer. Boy! I was I glad to have read about this before even considering using my spray bottles with cadmium-based paints! But while diving deep into the product safety data sheets of the major paint manufacturers – honestly, it can really feel like reading Chinese sometimes- I also found out that they warn about prolonged or repeated skin-contact with their paints. This really got me thinking: is it safe to frequently use my hands as painting tools? Especially when I’m not 100% sure the paints I use are safe? My conclusion? 2) I’d rather stick to that good old paintbrush. Better to be safe than sorry, right? And if I do feel the urge to let the child in me indulge from time to time, I’ll go with some non-toxic alternatives like eco- and child-friendly finger paints, or better yet, make them myself with some natural ingredients. ‘Cause, hey, we all need a spark of childhood memories from time to time, right? That’s it for now. Safe painting my friends! And if you liked this post, please check out my blog on www.elmahogeboom.nl/blog or follow me on Instagram (@elmahogeboom). Talk to you soon!